ORCID is a world wide researcher identification number. Because referencing systems over simplify our identities to things like “Smith, J.”, “Singh, J” or “Chan, T.” we need a much better way of Identifying or ‘disambiguating’ ourselves. ORCID, set up relatively recently, and supported by all the major publishers and academic institutions does that well. You can set up a profile, link your work, education, funding and employment to it, and everyone knows that you are in fact you. But there is a fly in the ointment. I’ve set myself up (and this was on my official ORCID record) as a professor at MIT. ORCID believes what you tell it, and though it clearly states what the source of the information is, it could be misleading. Worse, a bad person could try to steal my identity by creating a false ORCID record for some nefarious purpose, imitating me. The way around this is for institutions to verify the information that ORCID record holders have put into their profiles. 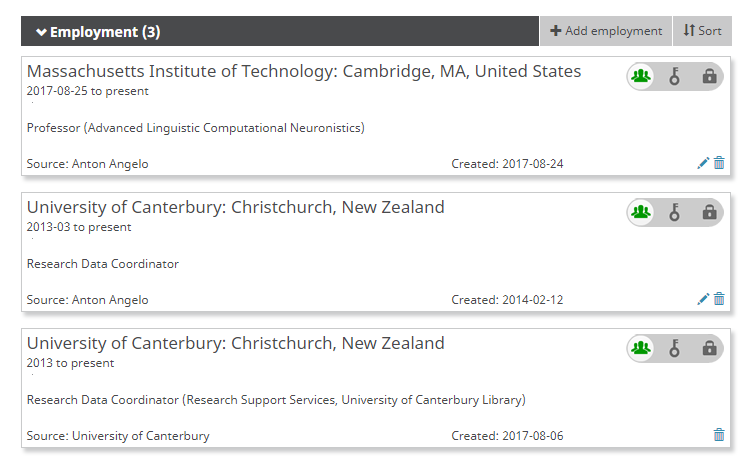 Notice above I have two employment records (both truthful) for The University of Canterbury. One I put there, and the other the University added. For my employer to do this, I had to give permission to them through the ORCID system so they could update my record. They can’t change anything else, just edit and remove records they have added themselves. ORCID lets me delete records they have added, but not edit them. In New Zealand we are building a system, the ORCID Hub, to nationally manage this process for research institutions. The plumbing behind the system is a little complex, but the idea is reasonable simple. 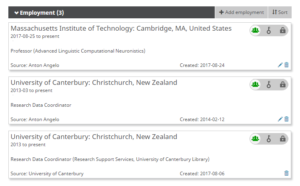 Researcher signs into the NZ nationwide academic authentication system (Tuakiri) through the ORCID hub. Then they sign into ORCID, and give permission to their institution(s) to be able to verify their affiliation with them (as a staff or student, or both). So, ORCID is a little broken at the moment, but we can get genuine affiliation records, which will go further to doing what ORCID was intended to do: trustworthy disambiguation for researchers. Prev Why you can’t verify who is emailing you, and why you might have been able to.